Today the whole world watched a fairytale unfold as American girl Meghan Markle married her prince charming, Henry Charles Albert David fondly called by everyone as Prince Harry who is a member of the British Royal family. The wedding was held at the St. George’s Chapel inside the compound of the Windsor Castle and was broadcasted live for the whole world to see. Watching the festivities on tv this morning brought back memories of my visit to Windsor three years ago. I was in London for vacation and booked a day tour to the royal compound where I got to explore and photograph Queen Elizabeth’s weekend home. Unfortunately, photography is not allowed inside the buildings so most of my photographs were just of the facades. While walking on the grounds in front of the castle, I saw an arch with an opening to a view of a long road extending all the way to the horizon. I took multiple photos of the arch not knowing what the road was for. Today my question was finally answered…Prince Harry and Meghan was carried down this road on a horse drawn carriage to greet thousands of well wishers. The road is called The Long Walk and it connects Windsor Castle to a park called Snow Hill. According to legend, King Henry VIII sat at Snow Hill to wait for news about the execution of his wife Queen Anne Boleyn. But today a new legend about this road has been made…it will now be known as the road where someone’s fairytale became a reality. 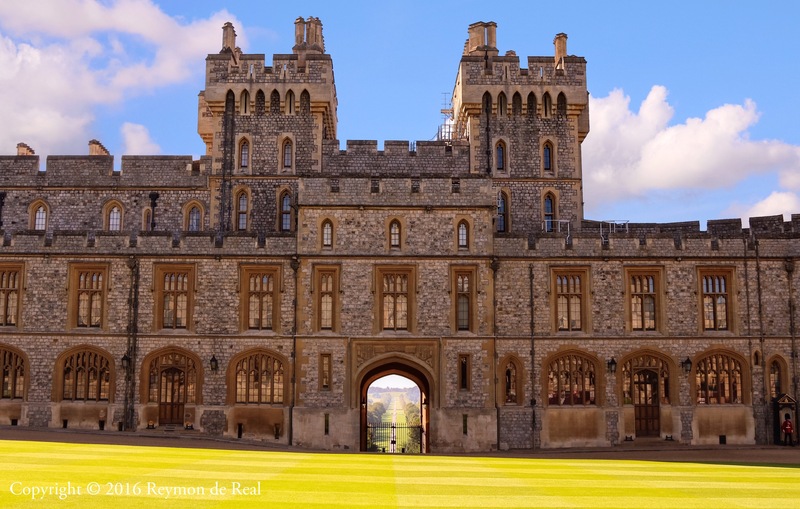 The Windsor Castle is the largest and oldest occupied castle in the world and it’s where Queen Elizabeth spends most of her private weekends. The castle has been the family home to British kings and queens for over 1,000 years. During my visit to Windsor the queen was not around, which is signaled by the Royal Standard flag flying from the castle’s Round Tower. My tour of the castle included viewing of the royal apartments, state rooms, galleries, changing of the guards and the magnificent St. George’s Chapel. I joined a guided tour of the castle, which I think is the best way to experience it as you hear a good number of royal trivias and learn a generous amount of information and history about this famous home. Furthermore, being part of a tour allows you to skip the long lines to the ticket booth which can take at least an hour of your time. The castle is a reflection of the massive wealth of the British Royal family and throughout the tour I kept imagining how fascinating it would be to be a royal…even just for a day.